These homes are on Wallowa Lake. 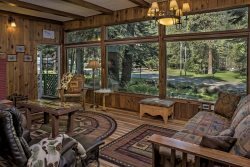 They offer private Wallowa Lake access and private boat docks. They offer stunning views of Wallowa Lake and the east morraine. These homes are located on the more quiet side of Wallowa Lake and are about a 20 minute drive to Wallowa Lake's seasonal activities.